Topics: Kitchens, Bathrooms, Fireplaces, Bespoke, and Commercial. 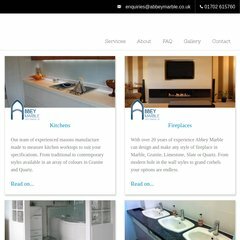 abbeymarble.co.uk Abbey Marble, suppliers of granite, quartz, marble and natural .. It is hosted by Strato Rechenzentrum Berlin (Berlin, Berlin,) using Apache/2 web server. Its IP Number is 81.169.145.158. docks07.rzone.de, and shades04.rzone.de are its DNS Nameservers.